Flores Quilt, Sham and Decorator Pillow Set is a great way to bring handcraft workmanship into your home. 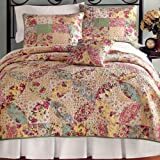 This quilt set has classic vermicelli stitched quilting and features a patchwork design in multiple floral prints in shades of cream, white, purple, pink, blue and green This is a great way to update your bedroom decor with a cozy quilt set. Set includes one king quilt 104″ x 90″, two king shams 21″ x 37″ and one 15″ x 15″ quilted pillow. This entry was posted on Saturday, June 5th, 2010 at 9:25 pm	and is filed under Quilt Items. You can follow any responses to this entry through the RSS 2.0 feed. You can leave a response, or trackback from your own site. This is a gorgeous quilt! The photo doesn’t do it justice because the colors are much more cottage color scheme. It is thin, but very well made. It would not add a lot of warmth to your bed, but you can always layer it over a thicker comforter, and have this beautiful quilt as the artwork for your bed. By the way, you can also get this quilt at JCPenney.